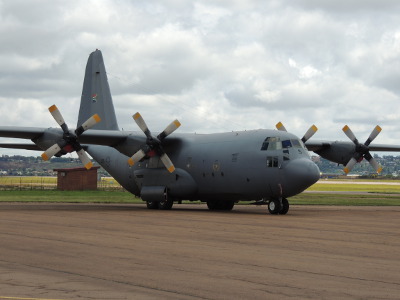 A C-130 Hercules transport aircraft landed in Pretoria in the early hours of Friday morning containing the bodies of the remaining South African victims of the Nigerian building collapse tragedy. “The mortal remains of the outstanding 11 compatriots who perished on 12 September 2014 when the SCOAN [Synagogue Church of All Nations] guesthouse collapsed in Nigeria are all back,” Minister in the Presidency Jeff Radebe said shortly after the aircraft landed at Waterkloof Air Force Base. The bodies were brought back to the country by a team of military health personnel and forensic pathologists who had departed on Monday night at about 9pm. Last year on 12 September, 81 South Africans were killed and 25 were injured when the multi-storey building collapsed in Lagos. President Jacob Zuma appointed an Inter-Ministerial Committee to oversee government’s response to the tragedy and to ensure the injured and the deceased were returned to South Africa. The National Joint Operational and Intelligence Structure (NATJOINTS) were activated to coordinate various role players and lead technical planning for the identification and repatriation of both the injured and the deceased South Africans. Seventy-four bodies were repatriated in November and a formal reception ceremony was held for the families of the victims. At the time, 11 bodies had not been positively identified and therefore could not be repatriated. “The mortal remains are now back… The families can now close the chapter as we are closing it today so that the last rights are performed so they can bury them with dignity,” Minister Radebe said. He thanked President Jacob Zuma for establishing the Inter-Ministerial Task team to deal with the repatriation process. He also acknowledged the NATJOINTS, medical personnel, scientists, officials from the Department of Social Development and members from South African Police Service. He said he was grateful for the assistance of the government of Nigeria in the identification and repatriation process. The mortal remains are expected to be transported to the nearest government mortuaries in the provinces where the families live.